Magnetic rollers are an easy way to achieve perfectly styled hair. We make it simple at Walgreens by providing you a large variety of hair care options. Rather than spending your time and money at the salon, invest in magnetic rollers that you can use at home. This no-fuss way to create cascading curls and waves is convenient for the busy woman. Discover how magnetic rollers can transform your look and add some dimension to your daily style. How Do Magnetic Rollers Work? Magnetic rollers easily snap into your hair, allow you to create curls without the heat produced by curlers and curling irons. After separating your hair into small sections of about 1 inch, simply place the roller at the end of your hair, winding the roller upward toward your scalp. The roller is secured into place with a metal clip. Apply these rollers to wet or dry hair, let them set, and then remove the rollers for the curls, waves, or added volume that you desire. When choosing magnetic rollers, there are several styles and varieties available. You can find magnetic rollers that come in packs of 8 or 10. Alternatively, you might opt for a larger variety pack, which includes up to 75 pieces. Smaller packs typically feature rollers of the same size, such as a 7/8 inch diameter or 1 1/8 inch diameter. Variety packs will give you rollers in a number of diameters. Wider rollers will create larger curls, while smaller magnetic rollers can create tight spirals. 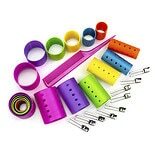 These rollers come in a number of bright colors, including pink and green. Magnetic rollers can create a variety of styles. Whether you want soft, loose waves, bouncy curls, or simply hair with more volume, you can improve your hair's appearance with magnetic rollers. As a result, your hair's volume can be enhanced by magnetic rollers as well. These rollers offer a smooth surface, which protects your hair from any damage. You can expect to experience less hair breakage with magnetic rollers because they are gentle on your tresses. Additionally, magnetic rollers tend to work well for hair of all hair lengths and textures. Enjoy salon-quality hairstyles at home with magnetic rollers, a smart addition to your beauty and hair care routine.